Ready for some news that will make our MuckFest Giveaway even sweeter? MuckFest released their full event calendar for 2019. What's better than getting muddy for a cause? Today, the National Multiple Sclerosis (MS) Society and Event 360 announced that the 2019 MuckFest® FUN Mud run event series will take place in Boston, Philadelphia, New Jersey, Chicago and Denver. MuckFest is a 5K mud obstacle course that requires no training and is for any level — from the beginner to the star athlete. 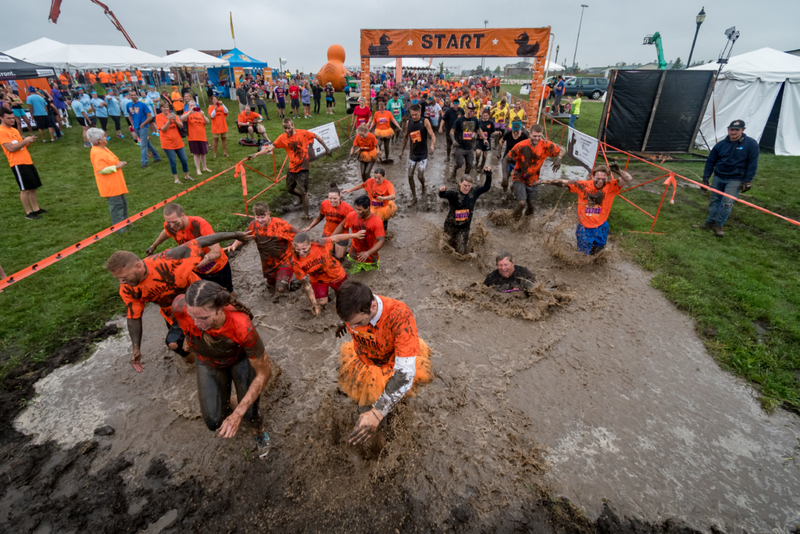 MuckFest can be experienced for the pure fun of the obstacle course and participants are also encouraged to raise funds for the National MS Society to help people living with multiple sclerosis. Registration for the events is now open at www.MuckFest.com. The cost to register is $105 with discounts for early registration as well as for verified military members, first responders and government employees. Group ticket packages are also available. Registration is free when a participant becomes a “Mucker on a Mission” and commits to raising a minimum of $250 for the National MS Society. Registration includes a MuckFest t-shirt, race day photos, a snack bag, and (if you’re over 21 years old) a free beer. “MuckFest is all about bonding with your besties in the mud and muck. And we’re so thankful for the thousands of Muckers who also use MuckFest as an opportunity to raise awareness and money to help those living with MS and ultimately help fund research to end MS once and for all,” said Liz Strawn, Senior Director of MuckFest MS & Special Events, National MS Society. Since MuckFest started, more than 175,000 participants have raised over $30.7 million for MS research. 100% of the funds raised goes to the National Multiple Sclerosis Society’s efforts to bring an end to MS and to help those currently living with it. A new study shows twice as many people in the United States are facing the challenges of MS than previously thought. Now more than ever, we must accelerate our efforts to help the nearly 1 million people with MS live their best lives and end this disease for good. Incredible photo and video opportunities are everywhere at MuckFest. Get ready to capture the moment when your co-worker slithers through the Belly Crawl and for your boss to eternally remind you that she was the one who conquered the Walk on Water obstacle. Share the memories of that amazing jump your dad took into the Crash Landing inflatable stunt pad. Imagine the exhilaration of racing your brother up to the top of the mighty Mt. Muck-imanjaro or seeing if you can jump further than your sister from the giant Swing Set. Or picture your fiancé slithering through the Tunnel of Love or the two of you holding hands as you slide down the Slippy Sloppy obstacle. Preview all 18 MuckFest obstacles here. Participants must be at least 10 years of age on the day of the event. Participants who are 10 to 17 must be accompanied by a parent or on-event guardian. The ratio of guardian to minor-aged runners is 1 to 3. The event is free to spectators, and kids under 10 years old also have their very own play area named Lil’ Muckers where they can splish and splash. After the event, participants gather in the MuckFestival area to celebrate their efforts out on the course with a free beer or soda. The Society mobilizes people and resources so that everyone affected by multiple sclerosis can live their best lives as we stop MS in its tracks, restore what has been lost and end MS forever. Last year, the Society invested $35 million in MS research with more than 340 active projects around the world. Through its comprehensive nationwide network of services, the Society is focused on helping people affected by MS connect to the people, information and resources needed to live their best lives. We are united in our collective power to do something about MS now and end this disease forever. Learn more at nationalMSsociety.org. Event 360 is an experienced event management team offering a full range of services, including event production, social impact, fundraising technology, site logistics, communication strategies and customer service. Headquartered in Chicago with team members and partners working nationwide, Event 360 achieves success for its clients using peer-to-peer fundraising and unique events. Since 2003, Event 360’s experienced team of event management specialists have successfully produced more than 350 events, which have raised over a billion dollars toward their clients’ missions. Learn more at www.event360.com.